Qhehezu Tuccu has been elected as the chairman and Tongmeth Wangnao as the vice-chairman of NSCN (IM) for a tenure of six years during its National Hoho at its headquarters at Camp Hebron near here on Monday. NSCN (IM) ato kilonser Th. Muivah declared the election of Tuccu as chairman and Wangnao as vice-chairman, who will also be the president and vice president of the NSCN (IM) respectively for a period of six years as per its Yehzabo (constitution), the ministry of information and publicity of the outfit said in a release. 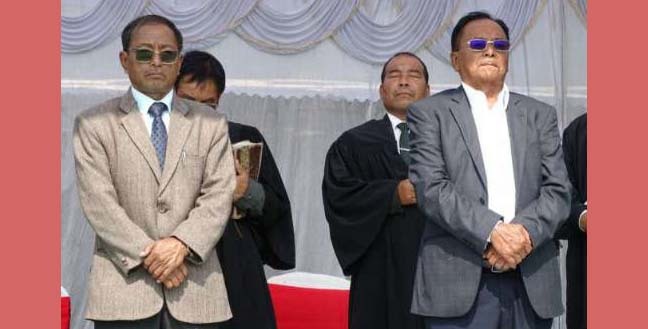 They were administered the oath of allegiance and secrecy by NSCN (IM)’s National Judiciary Board convener “chief justice” Khriesarokho Peseyie. The members of the NSCN (IM) National Hoho lauded Tuccu and Wangnao for filling up the posts of chairman and vice chairman which were lying vacant after the demise of Isak Chishi Swu and “Gen” (retd.) Kholi Konyak. Both were members of the collective leadership of the NSCN (IM) prior to their elevation to the post of chairman and vice chairman. The release said Tuccu joined the Naga national service in 1980 and Wangnao joined it in 1987. Muivah, prior to the announcement, asked the National Hopo members to adhere to the principle followed by former chairman Isak Chishi Swu, who declared unity of the Nagas in the name of Jesus Christ. Earlier, a senior claimed that Qhehezu Tuccu was not elected as the chairman of NSCN(IM).